Registrations and scholarship applications are now open! Sign up for our camp email list for any registration updates. Our spring break & summer programs connect kids to healthy food in the garden, in the outdoor kitchen, and at the picnic table! 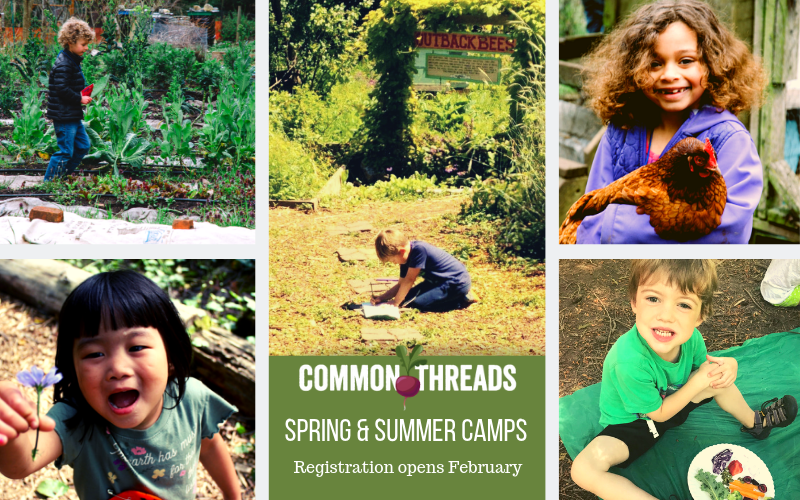 Common Threads’ Food Educators run both Spring Break and Summer Camps at The Outback, a beautiful farm and forest area located on the Western Washington University campus. Camps include a combination of exploring and appreciating nature, gardening on the farm, and preparing healthy snacks with some of the produce we find on the farm. Camps for older elementary students also include field trips. Please download the Common Threads 2019 Camp Information for Registrants for all logistical details. Scholarships: We are strongly committed to making sure camps are accessible to all. Information about financial aid can be found on our scholarship page here. Scholarship applications will be accepted once camp registration opens in February. Registration: Please consider creating an account so that you can log in and make future camp registrations easier for yourself. Waitlist: We require a minimum of 6 kids to run program. If a camp is full, you will be given the option to sign up on a waitlist. You will be notified if a space opens up. Sibling discount: If you are enrolling siblings at the same time,select “1 Child” for sibling #1 “1 Sibling for any sibling #2 (or 3 or 4, etc.). Th sibling discount is only applicable for a registration fee of an equal or lesser value. Later summer start date due to snow days? If the last day of school is pushed back due to snow days, our camp start dates will reflect this change. We may end up with a 3 or 4 day rather than a 5 day week of camp. If this happens, we will pro-rate the week’s cost and refund the difference to anyone who has already signed up. Kids will explore the garden using all of their senses, and help make yummy snacks fresh from the garden. And of course, we will visit the chickens. Count on dirty hands and silly stories! Join us as we plant and tend vegetables, prepare delicious food straight out of the garden, visit with chickens, and learn through hands-on exploration and experimentation. These camps take Farm Camp a step further and explore the origins of where some of our food comes from. How do you make the dough for pizza or pasta? What about cheese and tomato sauce? Where do different spices come from? Field trips are included throughout the week – past locations have included Bellingham Pasta Company, local pizza makers, the Community Food Co-op, Drizzle, Bellingham Food Bank and more.